Note: this post was originally published in November 2016. The information about Sundowners Vacation Villas is now up to date as of July 2018. What would be the best gift to receive? This! 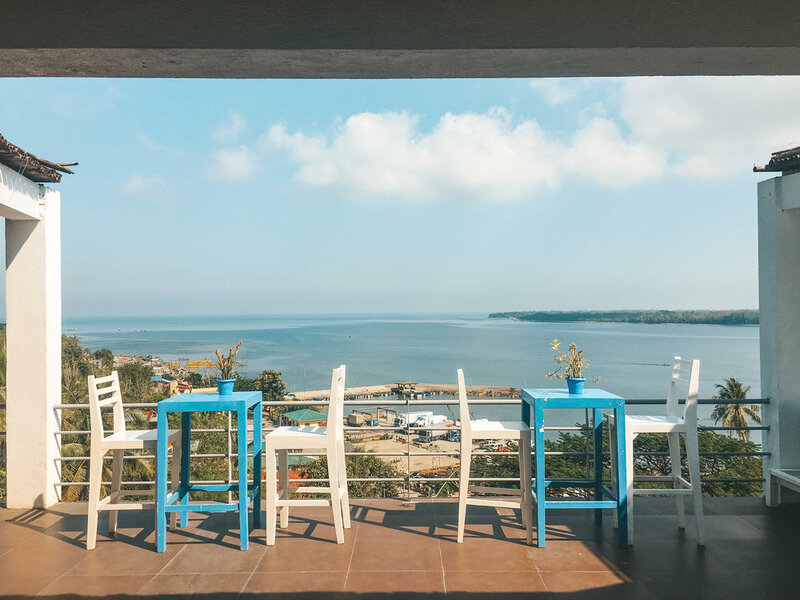 A getaway to Sundowners Vacation Villas; Santorini-themed villas in Bolinao, Pangasinan. Actually, I was supposed to celebrate my birthday last year here. Our trip was moved to this year because of some unfortunate events. No regrets though! All I want is to go here. One of my travel goals is to visit Santorini someday. Since I'm not financially ready yet for my Santorini trip, the least that I can do now is visit Santorini-inspired places. When I first saw the pictures of Sundowners Vacations Villas online, I instantly fell in love with it. I like its Santorini-themed villas; this will do for now! Sundowners Vacation Villas is just a 5-hour drive from Manila. We hit the road as early as 3 on a Friday morning. The check-in time at Sundowners is 2PM, but we arrived early so we went around Bolinao until we could check-in. Luckily, we were able to check-in at around 1:30 PM (Update 2018: 3:00 PM check-in time for cliffside and private pool villas, 1:30 PM for Marina Villas). Visit their website and choose the villa/s that you want to book. You can book directly on their website; or, you can contact them at their hotline numbers if you need assistance. Fill out the necessary information before booking. Sundowners Vacation Villas will be your sweet escape from the big city. Every villa has a fully equipped kitchen with dining/bar area, air-conditioned bedroom/s, bathrooms with hot and cold showers, spacious balcony and grilling area. When we went there, they only have 9 villas that you can choose from. But, now, they added more. You can check out the villas here. It just seems so romantic being in Sundowners Vacation Villas. Isn't it nice to just look at the horizon and think about... nothing? We rented the couple villa which is good for 4 - 6 people. Rent per night is Php 5,400 (Mon - Thu) or Php 6,600 (Fri -Sun) for 4 people and below. However, there is an additional Php 1,200 per person if beyond 4 people. Note: if guests are renting the Master villa, only the Master villa quests can use the infinity pool and Jacuzzi area. Since Sundowers Vacations Villas has a No Corkage Fee policy, you can bring your own food and drinks. Also, you cook your own food inside the villa. If you don't want to cook your own food, you can order at their restaurant that serves dishes under Php 200 instead. The appropriate time to book a villa is 2 to 3 months in advance. You can pay in cash or credit card through PayPal. Wash all the used kitchen utensils before you check-out. But, you can avail their dishwashing service for a fee. They do not provide any dishwashing soap, so you need to bring your own. Sundowners Vacation Villas is a vacation house, not a hotel. Make sure you bring your own toiletries. They provide a 5-gallon water upon check-in. You don't need to bring you own towels. When we stayed there, they already provided us towels. But, you have to bring your own shampoo, soap and tissues. There are villas that have a private pool. They do not have a beach. Though the villas are overlooking the beach. Couple Villa: Php 4,000 per night (Note: it was booked in 2015). Did I enjoy my stay? YES! I'm definitely going back. In fact, my friends and I have been thinking about visiting Sundowners Vacation Villas next year. We are eyeing the Linda Villa! For more information about Sundowners Vacation Villas, you may visit their website. Have you been to any Santorini-inspired places? If yes, please comment the places and your experiences! I would love to visit it.